Taz is Asian rooted yet inspired by British/American ideologies; this eventually brought about a stronger experimental reggae influence into his music and the inevitable collaboration with DJ Kendell on the album ‘Spirits of Rhythm’. He receieved ‘Best International Artist’ & ‘Best Performer’ – Award’ at the UK Bhangra Awards 1994. The success of ‘Spirits of Rhythm’ and his Album ‘New Dawn’, the follow up, took him from strength to strength and helped mushroom a global fan base. It was at this point that Taz gave birth to the now hugely popular fusion pop group ‘Stereo Nation’, consequently signing to EMI Premier UK. The act went on to have their first British chart hit, ‘I’ve Been Waiting’ and subsequently became an instant number one smash hit throughout Asia, as well achieving ‘Top Ten’ video on the UK music channel, ‘The Box’. Having achieved worldwide notoriety with the Multi Platinum Album ‘I’ve Been Waiting’, the success story continues! Taz went onto tour Europe with a ten-piece band throughout 1998 in order to satisfy the rapidly growing international fan base as well as the Far East, Indian sub-continent, UAE, Australia, Africa, South East Asia, USA and Canada. The new Millennium sees Taz with his band ‘Stereo Nation’, starting to delve into new musical territory, experimenting with R’n’B, Soul, Dance & Bollywood! Taz’s next album, entitled ‘Slave II Fusion’ released in December 2000, achieved approx. 120,000 sales units in the U.K/U.S.A territories and 3 Million units in India! Receiving ‘Best Selling Album Of year 2000 at the UK Asian Music Awards’. As a consequence to this success, Taz was approached by the internationally recognized Bollywood Film Industry to record and visualize a track for the film ‘Tum Bin’ – ‘Thora Daroo Vich Pyar Miladeh’ . The film went on to be one of the biggest successes in 2001, achieving Top Ten status in the U.K mainstream film cinemas, as well as being one of Bollywoods biggest films of the year. 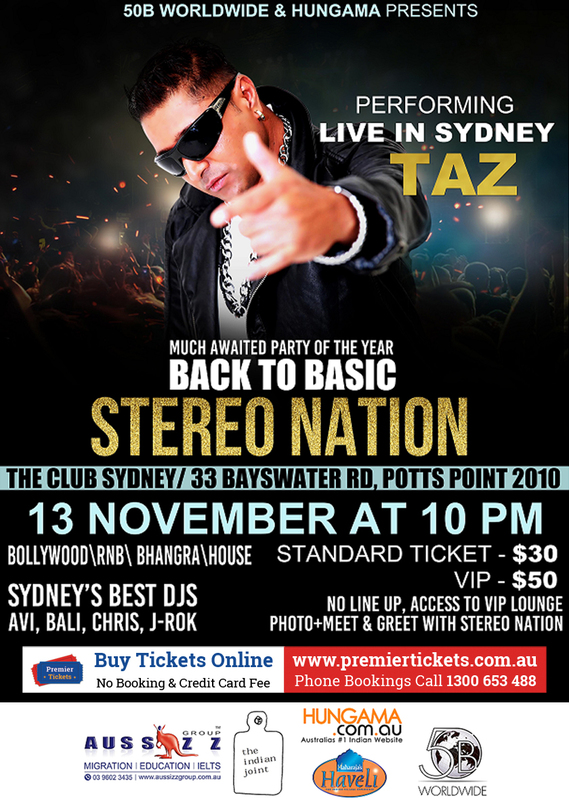 Since Tazs debut in Bollywood, he has been inundated with offers to further record sound tracks for the Indian Film Industry. Further to his success in Bollywood Taz performed at the Indian Oscars (IIFA) in Sun City South Africa 2001, which was televised to an audience of approx. 3 Billion across the world. During his time at the IIFA awards, Taz was approached by the crème-de-le-crème of Bollywoods elite, to record / visualise in further Bollywood movies. Due to popular demand Taz returned to the U.K to release his single ‘Laila’ into the mainstream charts. The single entered the British Charts at number 44. Taz also created history by being the first Asian Artist to visualise the accompanying video to ‘Laila’ by using CGI video technology. More recently, Taz performed at the Royal Albert Hall supporting the Charity of Afghanistan, as well as playing live at the Annual Gala for the Richest British Asian Awards at the Natural History Museum London in the presence of HRH Prince Charles. The follow up album to ‘Slave II Fusion’ entitled ‘Taz-Mania’, has surpassed the phenomenal success that its predecessor achieved. As a consequence to his success, Taz’s achievements have been recognised by the Guild of British Asians by being presented the award of ‘Best Music Act’ 2002, as well as being nominated in the same category at the Carlton Multicultural Media Awards 2002 alongside Ms Dynamite. 2003 saw Taz record once again for the ‘Bollywood Film Industry’. Visualised by Bollywood Heart Throb ‘Hritik Roshan’, the track ‘It’s Magic’ from the movie ‘Koi Mil Gaya’, went on to become the track of the year winning numerous awards at the ‘Bollywood Oscars’ in Mumbai this year. 2004 saw Taz release his latest smash, ‘Café Mumbai’. Recorded in London and Mumbai, the Album truly has worldwide appeal. Already ‘Ministry of Sound UK’ has picked up one of the tracks, ‘Ride with Me’, included in the compilation album ‘Urban Underground’. Having strongly established himself in ‘Bollywood’. Taz’s music has also been featured in a ‘Hollywood’ production. The track ‘Mehbooba’ featured in the Movie ‘New York Minute’ featuring: Ashley & Mary Kate Olson. Taz – The Hits FACTORY!!! Its 2008, and the Pop Icon, Singer Songwriter Taz – Stereo Nation has Set The World On Fire Yet Again With His Recent Offering To His Fans !!!!!!!!! The album has gone Multi-platinum World Wide, selling like hotcake cakes. Along with the busy Touring Schedule to promote the album, the Rock Star is also working on 5 Huge Bollywood Movies as we speak, recording the title lead songs for these films. The film titles will be released soon……so watch this space !!!!!! With more hits to his name than hair on his head, the man has already set India on fire again with his recent offering – the lead track to the film ‘RACE’ titled ‘Mujpe Tho Jadoo’, a collaboration with Music Maestro Pritam Singh. The demand for the song has been crazy to say the least and a worldwide super smash with his fans. TAZ has just performed for HRM Prince Charles Charity show at LORDS for the 20/20 Cricket for Rajastan Royals V Middlesex. 36. Mujpeh toh Jadoo – 2008 Film ‘Race’ a worldwide smash hit ! !